Did you notice that Six Flags, of AutoWorld infamy, filed for Chapter 11 on Saturday? They gave us abysmal advice on the AutoWorld concept. The same funding could have been spent on a medium-sized exhibition facility, and we'd still happily have it today...but they made their money from amusement parks, so everyone needed an amusement park. If it turned out that there were no customers, they could bail. It was our capital, and our one shot...we took the hit, they took their management contract money and left town. So, AutoWorld molders in a landfill somewhere. There's a bit of long-delayed justice in their going down. What am I missing here. Didn't we go to an amusement company and ask for their involvement in spending our windfall money. And then we said yah, sounds like a plan. As a former employee of Autoworld. The scuttlebutt was city management had something to do with it. They trusted the wrong people. And someone told them that if we build it they will come. Now, whoever came up with the auto theme I don't know. But someone at Six Flags should have piped in with "That's a dumb idea"
Would not surprise me, Rach. Remember, this is a city that built a hotel, a college area and a couple of too-small luncheon malls on the "If They Build It, They Will Come" model of development. Meanwhile whatever development was trying to go on that didn't fit in with their "Flint, Tourist Town" image kept getting fought against. The auto theme was doomed to failure from the beginning. 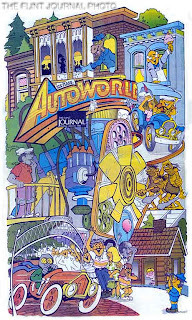 Everyone I knew snickered whenever they mentioned "Autoworld." I never was able to understand how that concept was brought to fruition; what were they thinking?? I did some historic consulting for G. Bridget Ryan and the Historic Auto World Foundation, primarily on the Wonder wall, and can tell you that the problem was that the theme was never articulated- whether to be a serious automobile history center or a theme park with thrill rides. The resulting poorly blended melange with neither research nor thrill rides satified no one.